The procedure called gastroscopy involves the placing of an endoscope (a small flexible tube with a camera and light) into the stomach and duodenum to search for abnormalities. Tissue samples may be obtained to check for H pylori bacteria, a cause of many peptic ulcers. 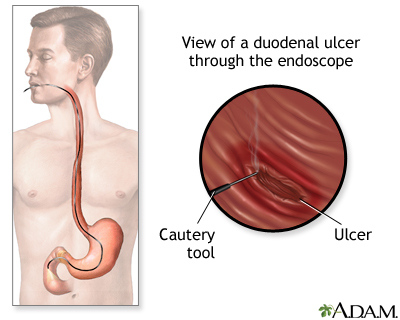 An actively bleeding ulcer may also be cauterized (blood vessels are sealed with a burning tool) during a gastroscopy procedure.